Berlin's genre-busting electronic group Modeselektor are the latest to get a turn in Get Physical's Body Language remixes series. The eighth instalment in the series features 29 remixed tracks by the likes of Animal Collective, Missy Elliott, Busta Rhymes, Major Lazer and Felix Da Housecat, all of whom get Modeselektor's special treatment of glitch, electro and hip-hop. Previous entries in the series include remix albums by Junior Boys, M.A.N.D.Y., Booka Shade and Matthew Dear. Modeselektor's Body Language Volume 8 will be released on September 25. 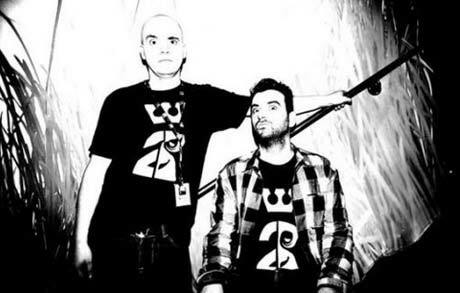 Meanwhile, Modeselektor are reportedly planning a North American tour in the very near future. As of press time though, no show dates have been announced. 3. Missy Elliott - "Lick Shots (Instrumental)"
4. Osborne - "The Count"
5. Boy 8 Bit - "The Cricket Scores"
6. Felix Da Housecat - "Kickdrum"
7. Alex Cortex - "Huyendo Part 2"
8. G-Man - "Quo Vadis"
9. Norman Nodge - "NN 8.0"
11. Peverelist - "Clunk Click Every Trip"
13. MOVES!!! - "All Skate"
14. Busta Rhymes - "Gimme Some More (Amended Version)"
15. Joker & Rustie - "Play Doe"
16. Mark Pritchard & Om'mas Keith - "Wind It Up"
17. Djedjotronic - "Dirty & Hard (feat. Spoek)" vs Dorian Concept - "Trilingual Dance Sexperience"
18. Horsepower Productions - "Let's Dance (Club Mix)"
19. Robert Hood - "Unix"
20. Major Lazer - "Pon De Floor"
21. Boys Noize - "Nerve"
22. Siriusmo - "Nights Off"
23. Modeselektor - "The Black Block (Marcel Dettman Redifinition)"
25. Animal Collective - "My Girly"
26. Modeselektor - "Fill #1"
27. Siriusmo - "Die Rockwurst"
28. Si Begg vs Juice Aleem - "Rock My Hologram (Original Instrumental)"
29. Moderat - "A New Error"